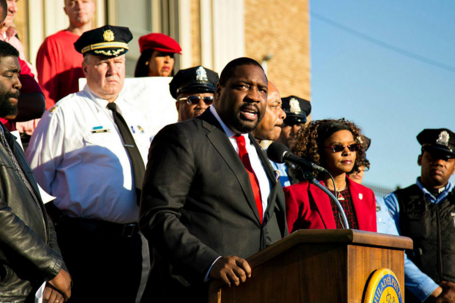 City Councilman Kenyatta Johnson speaks at a rally in this image from his official City Council profile online. It's hardly news that hundreds die from gun violence on Philadelphia streets every year. It's not even shocking to know that the city recorded more than 1,000 victims of shootings in both 2014 and 2015. But City Councilman Kenyatta Johnson (D-2nd District) says it should be. At his urging, a series of hearings around the city will focus on the issue of youth gun violence. Johnson said it's time for city officials to take seriously efforts to turn back the scourge of youth gun violence in Philadelphia. "I want to make sure that we are always keeping this as the number-one priority in the City of Philadelphia," he said during an interview held Friday. Talking about the initiative, Johnson mentions "Peace Not Guns" – a non-profit organization criticized by some in 2014 who questioned where donations to the group were going. He said the group works to teach anger management and "anti-street education" to city youth in an effort to stem the violence. Now, with these hearings, Johnson said, he will be able to expand his efforts to address youth gun violence by creating an action plan for the city. "This is how we are going to keep our fingers on the pulse of how we address gun violence," he said. With dates and locations still to be determined, Johnson said the hearings won't be one-night sessions quickly forgotten. Calling the fight against youth gun violence "the new normal," he said he plans join with local law enforcement agencies, community groups and fellow legislators on a "listening tour" across the city to first hear what the people in the community see as problems impacting their neighborhoods. "We need to engage the community on a grass roots level," he said. "You want to get input from the people who are impacted by the issue." Then, he plans to take that information and return with follow-up hearings in these communities to discuss ideas and possible solutions. Finally, he said, Johnson hopes to eventually unveil a new strategy and execution plan aimed at addressing gun violence in the city. "No child should have to go outside and worry that they're going to get shot," he said. Currently, he said, Johnson is working to schedule hearings and he will soon be holding a roundtable on youth gun violence with interfaith leaders in the city. He plans to have a full schedule of hearings scheduled in the near future. "At the end of the day, it's really about making this issue a priority," said Johnson.